Two identical pucks collide on an air hockey table. One puck was originally at rest. 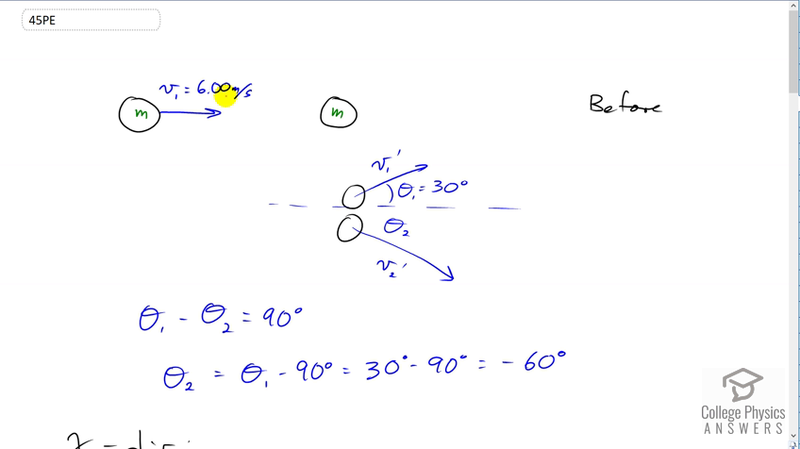 (a) If the incoming puck has a speed of 6.00 m/s and scatters to an angle of $30.0^\circ$, what is the velocity (magnitude and direction) of the second puck? (You may use the result that $\theta_1 - \theta_2 = 90^\circ$ for elastic collisions of objects that have identical masses.) (b) Confirm that the collision is elastic. b) Yes, the collision is elastic since the total kinetic energy before the collision is the same as the total kinetic energy after the collision. This is College Physics Answers with Shaun Dychko. We have two identical pucks on an air hockey table so they're sliding with no friction we assume. The first puck has a velocity of six meters per second and it's approaching the second puck which is initially at rest. I didn't put a subscript on the m's because they're identical pucks so they have equal mass. So we just call it m, there is no need for a one or a two subscript there. After the collision, which is this second picture here, we have puck one going at an angle of 30 degrees above horizontal, and we'll call that theta one, and that angle is given to us. We're told that we can assume that theta one minus theta two is 90 degrees. So we're basically being told that this is an elastic collision and so we can solve for theta two by taking this to the right side making it positive and then taking the 90 to the left by subtracting it from both sides. We get theta two is theta one minus 90 so that's 30 minus 90 which is negative 60 degrees. The negative means that this angle is measured clockwise with respect to the positive x axis. So this is 60 degrees below the positive horizontal here. So, momentum conservation in the x direction would say that the momentum initially which is the mass of this incident puck, times v one equals the x component of the momenta of each of the pucks after collision. We find that by multiplying m times the velocities by cosine of the angle with respect to horizontal. We can simplify this a little bit by dividing everything by m, and we get v one equals v two prime times cos theta two. So that give us this x component of this momentum from the lower puck. We're using cosine because this x component is the adjacent leg of this right triangle so we multiply by the hypotenuse by cosine of the angle to get the adjacent leg. Likewise for puck one, we want the adjacent leg for that triangle too. So we go v one prime times cosine of theta one to find its x component. That's as far as we can go in the x direction because now we have an equation with two unknowns, v two prime and v one prime. So in order to solve this equation, we need to find another equation to help because if you have two unknowns you need two equations to solve for them. So we consider the y direction then. Initially there is no momentum in the y direction and then after the collision the momenta will be m v one prime times sine theta one will give us the y component of puck one's momentum. Then I put a minus there because I can tell that the second puck is going to be going downwards, its y component is down and we are assuming our coordinate system is traditional with positive to the right and positive upwards. By the way, in putting this minus here means that theta two we're going to substitute a positive number because we've already accounted for this fact that the puck two is going down below the horizontal. So we could have written a plus here and then substituted negative 60 in for theta two. That also would work but my preference is to just always use positive angles and account for direction explicitly in the equation. So, we'll solve this for v two prime and that means we'll take this to the left side by adding it to both sides and then divide both sides by sine theta two and we get v two prime is v one prime sine theta one over sine theta two. Then we'll substitute that into the x direction formula. So we replace v two prime with all of this. So we have v one equals v one prime sine theta one over sine theta two times cos theta two plus v one prime cos theta one. Now we need to solve this for v one prime. We can do that because it's the only unknown and so we need to isolate it now on the left side of the equation. So we'll switch the sides around and factor out the v one prime which is a common factor among these two terms and then just because it looks nicer, we'll multiply this by sine theta two over sine theta two in order to have a common denominator here. So we have v one prime times sine theta one times cos theta two plus cos theta one times sinetheta two, all over sine theta two. All of that equals v one. Then we'll multiply both sides by the reciprocal of this, so multiply by sine theta two over this stuff there and you end up with this line, v one prime is v one times sine theta two over sine theta one cos theta two plus cos theta one sine theta two. Then we substitute in numbers. So we have six meters per second is the initial velocity of the puck one, multiplied by sine of the angle of deflection of the second puck, 60 degrees, divided by sine 30 times cos 60, plus cos 30 times sine 60, and we get 5.2 meters per second. That is 30 degrees above the positive x axis. Then v two prime is v one prime sine theta one over sine theta two. That is what we figured out here when we considered the y direction. Now that we know v one prime we can plug in that number and find v two prime. So we have 5.19615 meters per second times sine 30 over sine 60 giving us 3.00 meters per second and that is 60 degrees below the positive x axis. Then, we need to verify that this is an elastic collision which means verify that the total initial kinetic energy is the same as the total final kinetic energy. So I put a question mark above the equal sign here to say is this really equal? So we have one half mass times initial velocity squared and since the puck two is not moving, it has no kinetic energy initially. So there's only one term here and that is the kinetic energy of the first puck. Is that going to equal one half mass times v one prime squared, plus one half mass times v two prime squared? We can simplify this by multiplying everything by two over m and this gives us v one squared equals v one prime squared plus v two prime squared. So v one is six meters per second so we square that to get 36, and then v one prime is 5.19615 meters per second. We square that and add that to three squared and we end up with 36.0 equals 35. 99997. This is close enough. If we had included more digits in this number we probably would get even more closer to 36. So yes, this is an elastic collision because the kinetic energy is conserved.